Originally released in 1996, “The Curse of Mankind” is generally considered as a true milestone in the Norwegian band’s discography. A reference point for the parallel project known as Joyless, this Forgotten Woods’ classic drowns a raging coldness into a decaying scenario. 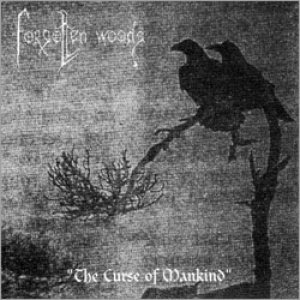 “The Curse Of Mankind” is to be considered as a primeval evolution of the typical grim Norwegian Black Metal style, in a similar way to how Burzum evolved into a more transcendental naturalistic form. It reaches an epic mood without choosing the easiest way, instead digging into dark territories. Contempt and spite upon a scene seeking for a commercial label proved to be an incredible source of inspiration in shaping an unique album. Following the success of the “As the Wolves Gather” reissue, with this new chapter ATMF adds another gem to its series of cult editions. The first run is limited to 500 copies and includes an unreleased / alternative song as well as the usual extensive track-by-track retrospective by former member Rune Vedda, explaining all the direct and indirect inspirations that made “The Curse… ” to happen. The liner notes will be accompanied with the old, original artwork, to not ruin the album’s primeval feeling. We emphasize that this new edition of “The Curse Of Mankind” is the only edition fully endorsed and supported by Forgotten Woods, any other edition is simply ripping-off their rights and their fans.